News of an NCAA record falling made it all the way to Mississauga, Ontario, where Kyle Collinsworth was settling in after another day in the NBA's G League. Collinsworth couldn't figure out at first why his phone was blowing up on a late-December night. Turns out a woman -- Oregon's Sabrina Ionescu -- had just recorded her 13th career triple-double, breaking his old mark. The triple-double record might not be the most glamorous one in the books, especially in today's one-and-done world of college basketball. But it was a big deal at BYU when Collinsworth broke it back in 2015. Shaquille O'Neal and Jason Kidd are on that list. Curious, Collinsworth clicked on a link attached to one of his Twitter mentions and watched a two-minute highlight of Ionescu's 17-point, 11-rebound, 13-assist performance against Air Force. "Man," Collinsworth said to himself, "she can hoop." There's an old video that might explain how a person who is not particularly big or fast became one of the best players in women's basketball. Ionescu (pronounced yo-NESS-coo) is wearing two casts on her legs, one pink, one fluorescent green. She's in middle school and has a split bone in each foot. Despite being ordered to stay off said feet, she is playing one-on-one with her brother. The video stops when they begin wrestling on the ground for a loose ball. Neither Dan Ionescu nor his ex-wife, Liliana Blaj, can explain why basketball is so important to their daughter, why she nearly vomits before games because she wants to win so badly, why she used to watch the older kids practice -- after her own workout -- just so she could learn more. "Obsedat" is what it would be called in their homeland of Romania. Obsessed. Sabrina Ionescu barked at her Oregon teammates for missing layups. In summer open gym. As a freshman. "I was like, 'What the heck?'" said Ducks junior Ruthy Hebard, one of Ionescu's best friends. "Now I know it's who she is. She's a huge competitor." The Ducks know they might be onto something special. They're 29-4, ranked seventh in the country, and when they are on, they're so good that they can crush an elite team such as Stanford by 40 points, a loss that happened to be the Cardinal's worst in more than three decades. The Ducks can be rock stars, getting a Twitter shout-out from LeBron James and a visit in the locker room from Kobe Bryant. On Friday, Oregon begins its national title pursuit with a first-round women's NCAA basketball tournament game against Portland State in Eugene. Ionescu now has 17 triple-doubles, and though no record is unbreakable, hers might stand for a long time. If the junior decides to skip her senior season, Ionescu is projected to be the No. 1 pick in the WNBA draft. Washington State coach Kamie Ethridge, a triple-double victim in January, voiced what 10 other Pac-12 coaches are no doubt thinking. 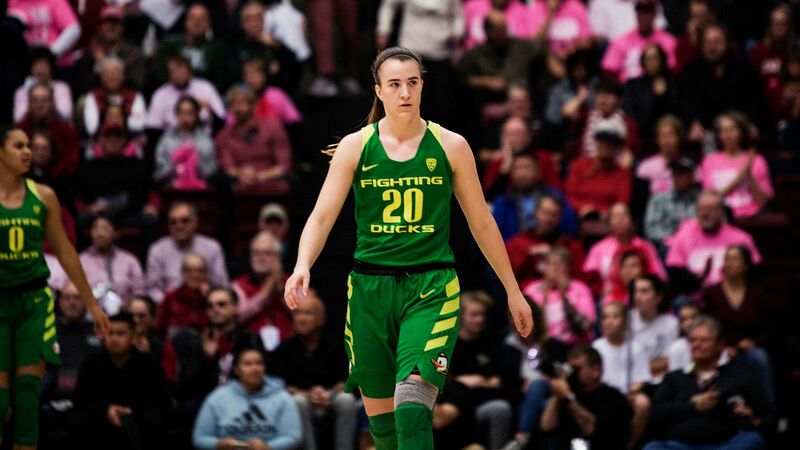 "She's a once-in-a-generation talent," Oregon associate head coach Mark Campbell says about All-America guard Sabrina Ionescu. The Ionescus knew little about basketball. There were more pressing things going on in Romania in 1989, most notably a revolution. In search of a better life, Dan Ionescu packed his bags and headed for the United States seeking political asylum. Liliana and their 2-year-old son, Andrei, had to stay behind. Check out Tournament Challenge for live updates and a chance to win $5,000 in Amazon.com gift cards. 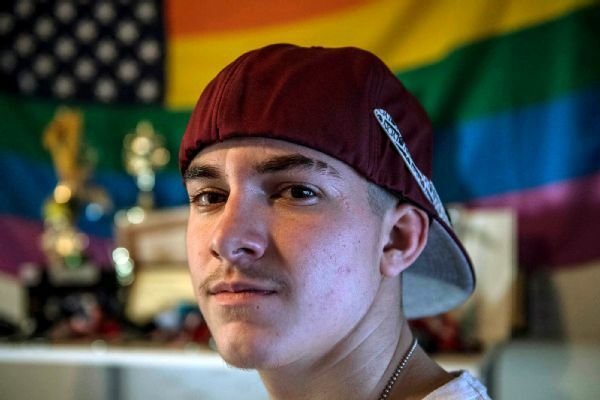 Dan planned to send for his family in six months. It took five years before they could join him in Northern California. With no cell phones, they communicated mostly by letters. "Initially, it wasn't hard because you don't know anything," said Dan, who picked Northern California because he had family there. "I was young. I was looking at the future, and you just jump in the water. Trying to shoot for a better life, a better opportunity for the family ... not knowing what's on the other end. "Nobody prepares you for coming to the United States. As time went by, it went harder. It was very hard. But what are your options? To fail or fight through." Raising a young son alone in Romania was a struggle, Liliana said. She's more measured with her words than her ex-husband. Dan eventually found what he called the American Dream, turning a taxicab job into his own limousine company, and in 1995, Liliana and Andrei were able to join him in the United States. Two years later, Liliana learned she was pregnant with twins -- a boy and a girl. She was bedridden for the final six weeks of her pregnancy because the babies were so big. She remembers that it was sprinkling the day the twins were born. Sabrina came first -- of course she had to be first -- and Eddy was born 18 minutes later on Dec. 6, 1997. By birthright and personality, Sabrina became the big sister, the leader of the two. Girls mature faster, Liliana says, but Sabrina really took charge. By the time she was 5, she was ordering both of her brothers to do their chores. The kids spoke Romanian as their first language but quickly learned English. They're still fairly fluent in their parents' native language. When Eddy and Sabrina want to make fun of someone, they speak in Romanian. Knowing the second language also served as a great advantage as kids when they hustled unsuspecting 2-on-2 foes. They could go over any game plan they wanted. The twins' introduction to basketball came out of necessity, in a way. "I really didn't feel like having kids jumping on my head in the house," Dan said. "My incentive was, 'Can I just relax and watch some TV? How can I do that? So let's get them tired.'" He dropped the kids off at Larkey Park, a 13-acre playground open from dawn to dusk, in Walnut Creek, California. The Ionescus took full advantage of those long hours in the summer. They'd play from morning until night, bodies flying in the air, knees and elbows bloodied. Sabrina was little then but always felt safe. "It wasn't like it is now where everyone is so ... I don't know," she said. "I feel like there is more harm in the world now than there was back when we were younger. Or we just weren't aware of it. "[My parents] were busy, they worked, so they dropped us off there, and we had each other, so that was easy. They never got me trainers. They just rolled the balls out and let me do whatever I wanted, and that's just what I took up." The school counselor called when Sabrina was in middle school. She warned Liliana that her daughter was bound to struggle when she got to high school because she didn't have any female friends. Liliana listened to the counselor, politely said she'd take the conversation under consideration and didn't do a thing. Why would she change Sabrina, who was developing into a confident young woman, who was happy doing the one thing she loved? "She was a boy, if you will," said Dan Ionescu, a comment that might very well make Sabrina revoke any further interview privileges for him. "I don't think she ever had dolls. She was always a tomboy. "Eddy made her that way because he was a boy, and she wanted to be accepted by the boys. And she'll never give up on anything." Sabrina didn't need dolls. She lugged around a pair of sneakers in case her brother's team needed a sub. And Eddy never minded when she tagged along and wanted to play basketball with him. "That's my best friend," he said. "My little guardian." When it came time to pick teams, he chose his sister first. He knew what he could expect from her. It probably sounds clichéd to say that Sabrina's laser no-look passes and general toughness were born out of surviving against bigger and stronger beings. But it certainly helped her rebounding. She didn't get the ball a lot when playing with the boys, so she learned to crash the boards. And those 266 assists she has this season? Those can be traced back to playing so many extra games. "She sees things and anticipates things that nobody else sees," Ducks associate head coach Mark Campbell said. "I would compare it to Peyton Manning or Steph Curry or Steve Nash." Playground rats don't necessarily see basketball along gender lines. As a kid, Collinsworth used to watch UConn women's basketball with his mom, Alisa. He played 2-on-2 with a girl, his cousin, Charlee Kinghorn. Years ago, a young girl named Jackie Stiles used to play one-on-one with boys, too. 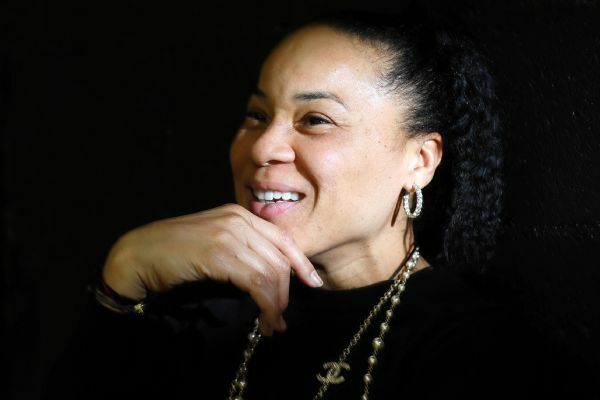 Stiles came from a tiny Kansas town called Claflin and captivated the country when she went on to set the NCAA women's scoring record and lead Southwest Missouri State to the Final Four in 2001. 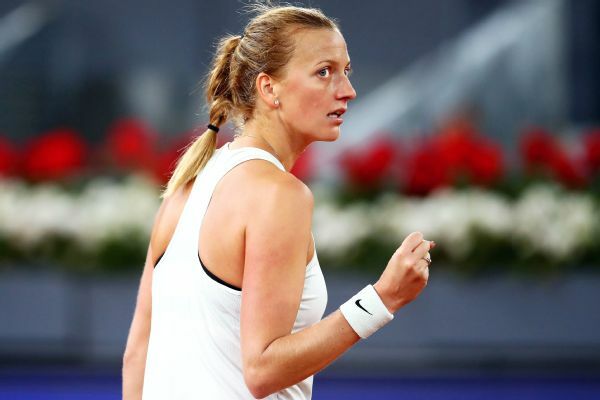 She was by no means a prototypical athlete; she stood a wiry 5-foot-8. But if there was an advantage to growing up in a place with only 600 people, it was that it forced her to play one-on-one with a couple of twin boys in town who were older than she was. It helped her create her shot off the dribble and defend. When Stiles does clinics, she tells kids to play one-on-one as much as they can. Stiles, who is now an assistant at Missouri State, which plays DePaul in a first-round tournament game Saturday, watches Ionescu and wishes she'd had the chance to play against her. "I just think the way she can create her shot, she's obviously played against some really good athletes that have pushed her," she said. "You don't develop those kind of moves that she has just sitting in gym working on your shot. "You can see the passion and love of the game when she plays. There's something different about her. She's just got 'it.' She has a will to win." Ionescu is locked in on a recent road trip to Stanford. Mark Campbell followed Sabrina Ionescu long before she landed on the national radar. Campbell says it started when Ionescu was a freshman at Miramonte High; Miramonte coach Kelly Sopak, who also coached Ionescu in AAU, says it was in junior high. Regardless, there wasn't much to look at back then, at least not from a physical standpoint. Ionescu had long arms and legs that were waiting for the rest of her body to catch up. But Sopak told Campbell that if he got a minute, he should check out Ionescu because she had "a chance to be pretty special someday." In the beginning, Campbell was the only coach watching. But soon Ionescu became one of the best players in Northern California, then the whole country, and Campbell followed her all the way to the Czech Republic to watch a USA under-17 basketball game. Ionescu had her pick of college choices, but she couldn't make up her mind. National letter-of-intent day came and went for the Class of 2016 without a commitment from Ionescu. Months dragged on, and other opportunities arose. The Ducks had a chance to land two key transfers but passed. They had to hold a scholarship for Ionescu. They waited. The cutoff for Ionescu to enroll and make an overseas summer trip was fast approaching. They still waited. 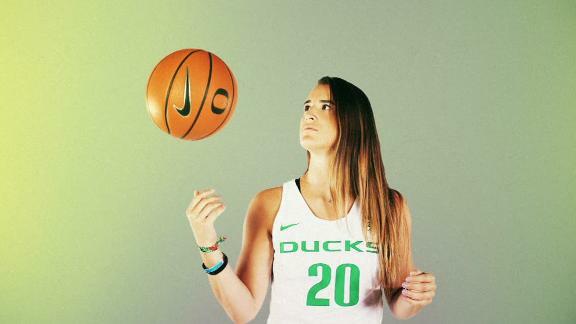 In June 2016, just before summer school started, Ionescu got in a car with her dad and drove eight hours -- unannounced -- to Eugene, Oregon, to announce her decision. She walked in the gym and told coach Kelly Graves she was going to be a Duck. He hugged her. It was an emotional scene. "She always tells a story that it looked like I was ready to cry," Graves said. "I'm going to say on the record that I didn't cry. "But I was really excited." The Ducks are 29-4 under coach Kelly Graves, who is a perfect foil to Ionescu's serious on-the-court demeanor. Back in the mid-2000s, Graves built a powerhouse at Gonzaga. He never wanted to leave, but in 2014 Oregon came calling, and Graves knew that he might never have that kind of opportunity again. He called the Ducks' program a "sleeping giant." Within three years, with the help of Ionescu and fellow freshman Hebard, they'd be playing deep in the NCAA tournament. Graves is big on relationships. He says it's so important with women. He's outgoing, self-deprecating and funny, the perfect foil to Ionescu's perpetually serious face on the court. When Ionescu puts too much pressure on herself, Graves gives her balance. "Some days I want to pull what hair I have left out," he said. "But most days I'm very grateful for Sabrina. I mean, she's an incredible talent, obviously, an incredible competitor. "Is Sabrina too intense? Yes. But she has to channel it in the right way. You can never be too intense on the basketball court, I don't think, or in practice. And the consistency with which she is intense in games, practice, anything she does on the court, I think, is what sets her apart." He does not like the way she reads every bit of criticism on social media and allows it to bring her down. He has told her to stay off message boards. He also knows that the words that hurt her also drive her. Ionescu makes a point to not be so tethered to her cellphone and reads books to pass the time she'd otherwise spend on social media. One of her favorite books is Mitch Albom's "Tuesdays with Morrie." Graves suggested she read it. Around midseason, she was reading "The Alchemist" by Paulo Coelho. It's about a young shepherd and his journey to the pyramids after a dream that he would find a treasure there. Her coaches don't like it when Ionescu takes the critics on social media to heart. She's her own worst critic, says roommate Lauren Sopak. It was Kids' Night on Feb. 22 when the Ducks had a No. 2 ranking and a raucous crowd for a game against UCLA. Many of the faces in the stands were little girls who came to see Ionescu. Although they were playing without Hebard, the Ducks built a 22-point lead and were rolling. Then everything fell apart in the second half, and Oregon was upset 74-69. Ionescu, trying to do too much, fouled out in the closing seconds. As she walked off the court, she chucked a water bottle into the hallway and kept walking to the tunnel. Hebard went after her, and Eddy followed. A few weeks later, the same Stanford team that Oregon humiliated on its home court beat the Ducks 64-57 in the finals of the Pac-12 tournament. Ionescu scored 27 points, but it was on 26 shots. John Canzano, columnist for The Oregonian, wrote that if the Ducks hope to win a national championship, Ionescu will need to stop forcing plays. Her intensity, coaches say, is what makes her great, and they don't want to quell that. But will it impede her from getting what she wants the most? The Ducks share a lighter moment during a practice to prepare for Stanford. It's a rainy afternoon in Eugene, and Eddy and Sabrina are sitting in a room in the bowels of Matthew Knight Arena, trying to settle an argument that has been raging for almost the entirety of their lives: Who's the best basketball player in the family? Eddy has a good six inches on her, but like every other time it comes up, no one is going to win this argument. They agree to say that their games are just different. Eddy committed to City College of San Francisco out of high school, and it was the first time the twins were apart. He decided to go to Oregon this past year and hopes to walk on to the Ducks' men's team next season. He figured Sabrina would challenge and push him. "I knew being surrounded by Sabrina and her work ethic, the people she hangs around with ... would definitely be a positive impact," he said. "It's the best decision for me and my basketball career." They live together in the Skybox Apartments, across the street from the arena. They share the place with Lauren Sopak, Kelly Sopak's daughter. Their apartment is neat, just like their mom kept things at home. Eddy cooks and is often Sabrina's sounding board after games. Sabrina did a Q&A for the team website her freshman year and was asked what her hobbies are outside of basketball. She said going to church, reading and playing more basketball. She's since found at least one other way to relax. On Mondays this winter, she would grab some cheese and crackers and watch "The Bachelor" with her roommates. Then it was back to the arena and their goal of reaching the Final Four. She cannot take her foot off the throttle. She's flying, full speed, unfazed by anyone bigger or stronger who might try to stop her. "It's worked for me so far," she said. "I can't stop doing what I'm doing. I'm not going to be anyone I'm not. If people don't like it, they don't like it. I'm not going to change for anyone." Elizabeth Merrill is a senior writer in ESPN's features and enterprise unit. Before joining ESPN in 2007, she covered the NFL and wrote features for The Kansas City Star and The Omaha World-Herald. She is based in the Midwest and can be reached at Elizabeth.Merrill@espn.com. Follow her on Twitter @MerrillLiz.